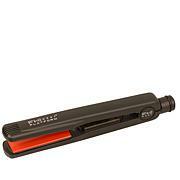 Travel-sized thermal styling brush and dry hold hairspray. Shake before using. 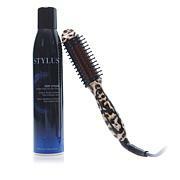 Hold can 6 to 8 inches away from hair, spray and style to desired look. For additional hold and to lock in style, spray evenly all over once hair is styled. Plug the Mini Stylus into an appropriate power supply. Switch the power button to the on position. The button will light up to indicate the thermal styling brush is turned on. I love this thermal brush. I have been looking for some sort of hair product that will give my hair volume for years and I have finally found it! Thank you HSN! This brush does exactly what was said in the demonstration on TV. I am pleased with it. Besides, it looks very pretty. Would make a great gift for a daughter or granddaughter for Christmas. I am pleased with this purchase. I had the large brush and I find the small one a nice compliment. I wash, dry naturally, straighten the hair with the large one and add some beachy curls just around the face. The two save so much time. Highly recommend. Hairspray holds too firmly for me. I found this product to be really helpful. I didn't use curling irons anymore because of how hot they were. This styling brush was easy to use and I love the end result. I liked it so much that I did send the travel size back and ordered the full size brush because I have longer hair.